Just as in various other domains of their lives, The Aztecs attached a lot of importance to education. Due to this reason, education was compulsory for all Aztec children, including boys and girls as well as the children of slaves. School in the Aztec Empire was not a place where just formal subjects were taught. Instead, basic military training was given to all the boys from their teens because the Aztec Empire was a military empire. There were separate schools for the children of the nobility and those of the commoners. Additionally, there were also separate schools for boys and girls. Girls had separate schools where they were taught subjects which were important for Aztec women. Since women could not hold political and military positions, these subjects were not included in their education. Instead, girls were taught various things which were important to run the Aztec household. This included cooking, sewing, weaving, and childcare. Additionally, girls were educated in religion and taught how to dance and sing, since dancing and singing was a part of Aztec religion. Girls were sent to schools at the age of about 12 or 13. Thus the main attention was paid on educating girls in disciplines that would make them better mothers and wives. Aztec boys, at about the age of 15, were sent to schools which were called Telpuchcalli schools, meaning “house of youth”. Aztec boys, at about the age of 15, were sent to schools which were called Telpuchcalli schools, meaning “house of youth”. Here the boys were taught various subjects related to history and religion. Additionally, Aztec education at these schools included the art of war and fighting as well as education in law and civic duties. Basic military training was very important and all the boys had to undergo this military training. There were military competitions between different schools which sometimes even led to fighting between them. There were different schools for Aztec children from the nobility and those of commoners. Both schools gave an education in history, religion, and military training. However, Aztec education for the children of the nobility included further subjects such as law, medicine, engineering, hieroglyphics, construction, and omen interpretation. These schools for the children of the nobility were attached to temples and were run by the priests and priestesses. A lot of children who aspired to be priests were also educated at these schools. Aztec education and routine at these schools for the nobility was difficult as students were subjected to strict discipline. Just like every other domains of life, Aztec education also reflected the social class structure of the society at large. Thus there were separate schools for the working class children. These common people were known as “Macehualtin”. These schools had limited education compared to the schools of the nobility and mainly included history and religion. Trades specific to their class were also taught at these schools. However, one thing that was common between these schools of working class children and the schools of the nobility was basic military training. Children of merchants, peasants, builders, and various other working class people went to these schools which were known as “telpochcalli”. The schools where Aztec education was imparted to the children of the nobility were called Calmecac. The kind of religious and military training given at these schools were tougher than the education given at the common schools. This was because children of the nobles were expected to become warriors which required extensive training. While these schools were mainly for nobles, some commoners who displayed exceptional talent could also be admitted to them. The Calmecac at the capital city of the Aztec Empire, Tenochtitlan, was situated in the ceremonial centre of the city. It was dedicated to the Aztec patron god, Quetzalcoatl. Children were sent to these schools at about the age of five or seven and the schools became their second homes. Before the age of 14, they were imparted education in various literary and religious subjects. After the age of 14, their military education commenced. Warriors from elite military orders such as Jaguar and Eagle societies trained students at these Calmecac schools. Other than the common schools where Aztec education included a diverse range of subjects, there were military schools where the sole emphasis was on military training. At these schools, Aztec education in military tactics was given by seasoned warriors. The reason for there being dedicated military schools was that the empire constantly needed new warriors and soldiers as there were constant battles needed as part of the Aztecs very Culture. Boys of the commoners who graduated from these schools had a chance to become warriors which gave them an opportunity to improve their social standing. 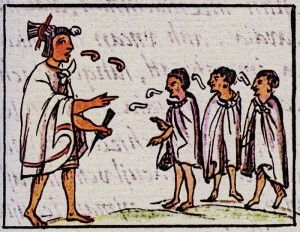 Important life skills such as farming, trading, and other professions were part of Aztec education. Boys were mainly educated in these and other outdoor tasks, in addition to their basic military training. Family education was reserved for Aztec girls as they could not take part in military and political administration and were expected to take care of the home. Due to this reason, girls received more Aztec education in family life compared to the boys. Girls from the nobility, however, could also choose to become priestesses for which they would go to separate schools. Thus while a lot of importance was attached to the military education in Aztec schools, they did not ignore the family education and life skills which made the students responsible citizens and equipped them to earn their living. Aztec society attached much importance to education and it was compulsory for all Aztec children to receive education at a reputable school. There were separate schools for the children of nobility and the common children. Common children were educated in religion, history, and various life skills related to their specific trade. Children of the nobles, on the other hand, were given an Aztec education in a more diverse range of subjects which also included medicine and engineering. However, basic military training was necessary for all the boys, regardless of their social class. 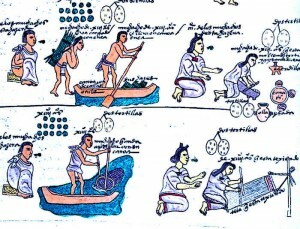 Aztec education for girls was mainly related to various household tasks such as cooking, sewing, and home economics. Girls from the nobility could also choose to become priestesses.